**Disclosure: We did receive a gift card for coming out and trying the yummy treats above! No monetary compensation was received. Who doesn't love ice cream, right?!? The temps here in Vegas are warming up, we've even had a couple days near 80! I have a feeling that Vegas is gearing up for a early and very hot summer. But honestly, why wait until it's 115 outside to enjoy some nice cold ice cream, especially from Baskin-Robbins. 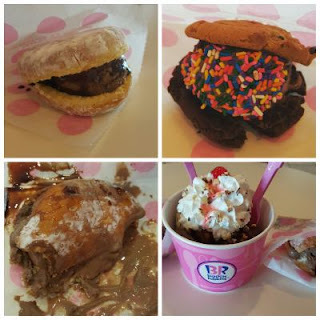 You'll especially want to run to Baskin-Robbins soon, I mean real soon.....they have a new Donut Ice Cream Sandwich that they are testing exclusively to the Las Vegas area for a limited time. In the picture above it is the product in the pictures on the left hand side. The picture honestly does not do justice. The donut itself is so fresh and soft, it's such a great combo paired with your favorite flavor ice cream and will really go with just about any flavor! I took my two kids with me as who else better to taste some yummy treats! The Donut Ice Cream Sandwich was a huge hit! While it is messy, it topped the list and is something I hope sticks around and become a permanent menu item. Their second new and might I add permanent menu item is their Warm Cookie Ice Cream Sandwiches and Sundaes. The cookies are nice and soft once warmed up and taste just like the cookies that comes out of your mom's oven! The Cookie Ice Cream Sandwich I'll say is a messy one, I highly recommend getting it in a cup and breaking up the cookie with your spoon while it's still warm. The cold from the ice cream did harden up the cookies, but if you break it up first then mix it with your ice cream, you're in for a yummy treat! You can pick any two cookie flavors you want, any topping and of course your favorite ice cream! It was def good, reminded me of when I was a kid being at grandma's house and she would make us ice cream sandwiches. One thing I do want to add, which I though was interesting was that every 31 Flavors is independently owned and operated by someone locally in your area. So when you go into your local 31 Flavors you're actually supporting a local family business. I love that!!! Visit www.baskinrobbins.com to find your local ice cream stop! Follow us on our social media channels as we'll also be giving away a $5 gift card to a reader! !